Home / 9mobile / New 9mobile 1.5GB for just 200 naira. Few Years back 9mobile formally known as “Etisalat" has the most expensive data plan, but now 9mobile is now increasing their plan massively. Imagine you can now get 1.5GB for just 200 naira this plan was introduce few days after the 4GB data cost of 500 naira was announced. This plan works for only new subscriber you can go to any nearest 9mobile center to get a new sim and register then dial 200 and select 2 That's moreCliq Enjoy extra value when you join MoreCliq. 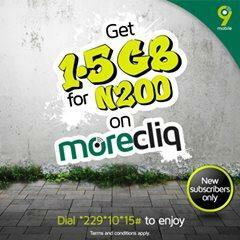 Get 1.5GB data for N200 only when you buy data within 30days. Then dial *229*10*15# for 1.5GB. NB: The subscription can be used at any time there are no limit or restrictions, and this plan last for 5days.